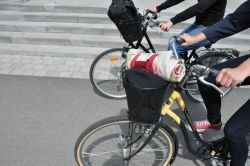 Kalmar has, during spring 2012, conducted a survey to find out what impact cycling consumers have on the commercial sector and what could make more consumers cycle to the areas of commerce. The analysis shows that 59% use sustainable forms of transport (cycling, walk, bus, train) to reach the city centre. 38% of the consumption in the city centre is generated by cyclists and pedestrians, 28% in the city as a whole. The main reason why car drivers do not cycle is due to lack of time or the need to load heavy or bulky objects. 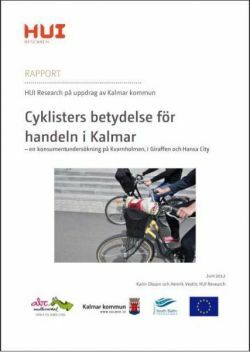 56% of all participants in the survey has heard of Kalmar Municipality‘s work regarding cycling and the over all grade for Kalmar as a cycling city was good; at 3,5 out of 5. The area that most participants saw a need for improvement in was cycling thefts and to make cycling lanes more securer. The results are the basis for a local workshop with all stakeholders in autumn 2012. The aim of the workshop is to improve conditions for cycling consumers and stimulate more to choose the bike instead of the car when possible. Kalmar's partners in ABC-project give their ideas for solutions in a following international workshop. Are cyclists important for the commercial sector? And if so, how can we get more people to cycle to the shopping areas? These are questions that Kalmar municipality wanted to get answers to. On the 13th of March 2012 they invited HUI research (Swedish Institute of Commerce) and the local commercial sector for a briefing. HUI Research carried out the survey in central Kalmar, in a shopping centre just outside the city centre and at an external shopping centre. The survey asked for mode of transport and how much was spent on the shopping trip. They also asked questions regarding how they feel about Kalmar as a cycling city. In total they interviewed 670 persons during spring 2012.